Sevilla´s Dream House is an ideal option to stay with family or a group of friends on your vacation time. Located just 2 km from La Fortuna down town you will find this beautiful house surrounded by nature that characterizes the area near the Arenal Volcano National Park. It has large green areas and private parking under roof. Close to the all main attractions and activities. Arenal Ixora´s is a cozy house located in a quiet neighborhood 500 meters away from La Fortuna Downtown, where you will find the heart of the town surrounded by cafaterias, restaurant, supermarkets and gift shops. 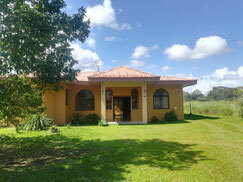 The house is fully equipied, with everything you need to enjoy the vacation time.